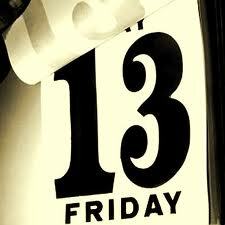 I never really knew why Friday the 13th was considered so unlucky – so I looked into it. What I found out that there are numerous reasons why this day is considered unlucky -0 some better than other but all I can tell you is that I now totally believe that it’s all superstitions and unless you want to believe in witches, goblins and all bad things, you really shouldn’t worry about bad things happening to you on Friday the 13th! There were 12+1 at the Last Supper – the 13th guest at the table being Judas…. The aura that surrounds Friday the 13th goes back to Friday, October 13th, 1307.On that day, Pope of the Church of Rome, together with the King of France carried out a secret death warrant against “The Knights Templar” The Templars were terminated as heretics and never again held the power they had before. Their grand master Jacque DeMoleywas captured, tortured and crucified. The six day of the week and the number 13 have bad reputation that goes back to the ancient times – but consider that in 2012, there will be the occurrence of Friday the 13th 3 times – and it will be thirteen weeks apart! As it was 100 years ago in Britain, where they tried to overturn the superstition that ships should not sail on Friday the 13th. The British government commissioned a special ship and named it HMS Friday. They layed her keel on a Friday, launched her on a Friday, selected her crew on a Friday, hired a man by the name of Jim Friday to be her captain. She sailed on her maiden voyage on a Friday – and it was never heard from again…..
And – if you have 13 letters in your name, there isn’t much that you can hope for: consider: Jack The Ripper, Charles Manson, Jeffrey Dahmer, Theodore Bundy,…….. But really – if you wanted to find something about any date, any day etc. combination – I bet it could be done! Hope you enjoyed this information – have a happy Friday the 13th and feel free to add to this anytime!